Four Functions of Management research papers discuss the modern management method, known as Fayolism, that describe the functions of management. French mining engineer Henri Fayol (1841-1925) is one of the fathers of modern management methods, and through his system, known as Fayolism, defined the four functions of management. They are: to forecast and plan, to organize, to command or direct, and to coordinate. 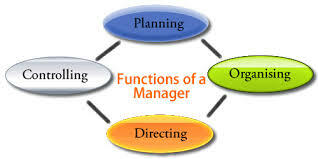 Planning is when a manager creates a detailed action plan that aims to achieve an organizational goal. Each manager must recognize the goals of the organization that fall within his or her area. Such planning is general highly specialized, based on organizational, division, departmental, or team goals. Organizing requires the manager to determine how he or she will distribute resources and organize employees according to the plan created in step one. The various role required by the team can be identified and assigned. Authority is delegated, work is assigned and the manager provides direction. Directing is another form of leadership. Managers must connect with their employees on an interpersonal level, encouraging them towards higher levels of productivity. While employees will carry out commands, they are more likely to voluntarily follow the directions of a manager whom they believe in and are inspired by. Controlling involves the evaluation by the manager of the results versus the goal. If a goal is not being met, the manager must take any and all corrective actions in order to meet the goal. Labor/Employee Relations research papers take a vast amount of time to outline and write. Paper Masters writes custom research papers on Four Functions of Management and discuss the modern management method, known as Fayolism, that describe the functions of management.